Don’t miss this once-in-a-lifetime opportunity to own a nationally award-winning* model home. 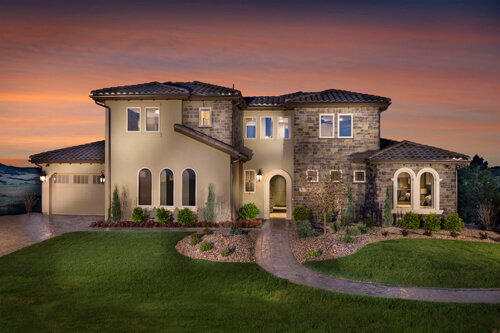 0.7-acre, fully-landscaped homesite that overlooks the private Club at Pradera golf course. A private interior entry courtyard with fireplace leads to a second level guest casita which includes a small kitchen, living area, bedroom and bath. The main level is built around a large covered outdoor living room with built-in grill, dining area and seating area with fireplace. One side of the main level includes a large gourmet kitchen, great room with informal dining, owner’s entry with mudroom, a powder bath, butler’s pantry with custom-built wine storage and a formal dining room. The opposite side of the main level features an expansive master suite with a spa-like bath, walk-in closet with adjacent laundry room, large study and second guest suite with private bath. The lower level is an entertainer’s dream with a large recreation room with walk-behind bar, custom-paneled gentleman’s lounge with fireplace, a third guest bedroom and full bathroom and unfinished storage space. Outside the lower-level walkout is a third covered outdoor living area that spills out to the infinity-edge pool and detached pool house with a full kitchen, great room with fireplace and spa bathroom with steam shower and separate dry sauna. This home is no longer available. View other homes available at Pradera here. *Best Interior Design and Best Outdoor Living, National Association of Home Builders 2015 & 2016.